Thanks for coming back to see the rest of my art studio. It's hard to miss the focal point on this side of the room. I found this large wooden easel at the thrift store for $8.00. It is solid wood and in great shape except for the front panel which has been replaced with particle board. I knew I needed to cover it up and decided a little paint job might be in order. Never one to shy away from color, I love how it turned out. The sewing machine table is another thrift store find. A coat of reddish orange paint transformed it into the perfect spot to add a few stitches to my art work. This framed canvas was used as a photo board in my old craft space. 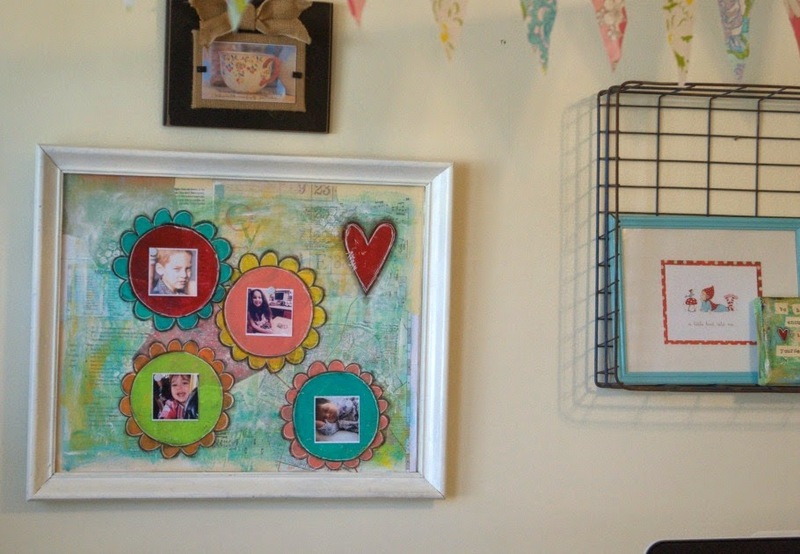 I knew I wanted a little more order in how I displayed my grand kids pictures in the new space so I treated the whole thing as a large mixed media art canvas and painted four flowers to frame each of my grand children's picture. The photos are held up with push pins which allows for me to change them as often as I like. I found this vintage wire basket at the Pasadena Flea Market a couple of years ago and decided to hang it on the wall and use it as a display case. The wardrobe mirrors will be used as a large display board and are slowly being used to showcase works in progress and copies of my favorite art journal pages. The small hutch is being used as my printer stand as well as magazine holder. I love the jewelry wall which I've shared with you before. I've stored my baker's twine in these sugar canisters for a while now and I still love the mix of cuteness and function. As you can see I hung a banner or two or three around the room as well. I love the natural light that flows into this room and the large trees just outside the window make me feel like I'm in a tree house. I added a row of white lights and my heart banner as a the window treatment. 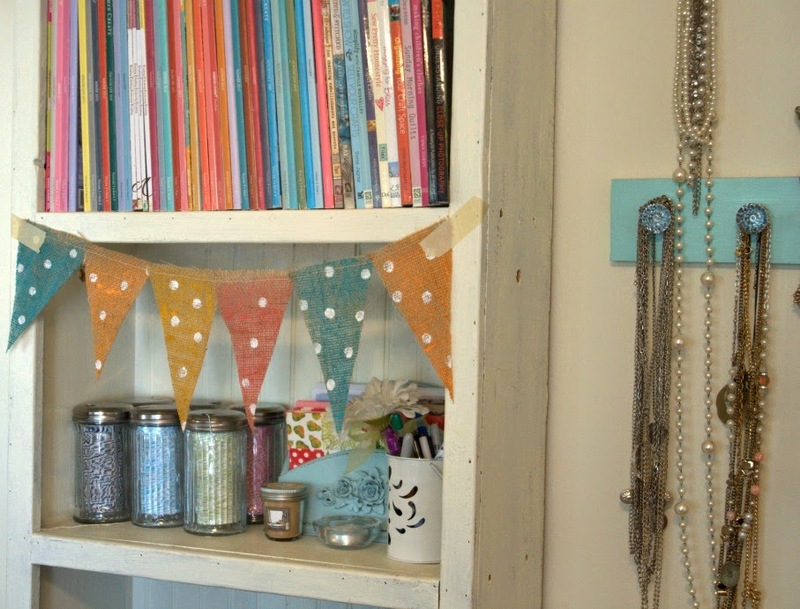 Vintage sheets are tacked around the open shelves to hide plastic storage bins and totes. I love that everyone including the dog likes to hang out in the chair while I'm working. My grandson thinks the whole room is too pretty to get all messy with my art but he's coming around. I'm glad I took these pictures when I did because it didn't stay this neat for very long. I think I would be worried if it did because the whole point of transforming the room was to get me creating and creating is messy, wonderful business. a light, bright cheerful place! 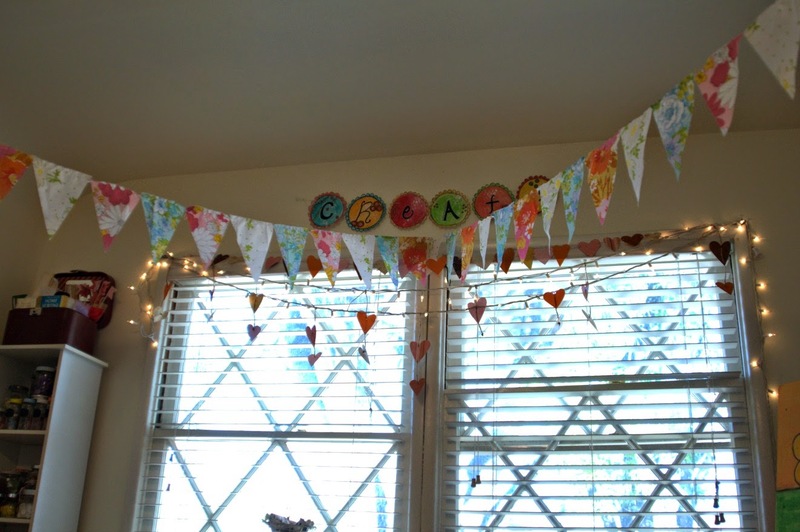 love the bunting! Good morning Patty. I saw your post on part 1 last night from my ipad, but sometimes have trouble commenting from ipad, so I had to wait til this morning, where I was excited to find that you had posted part 2!! I love every single square inch of your room. It is charming from top to bottom, and so perfectly suits you. 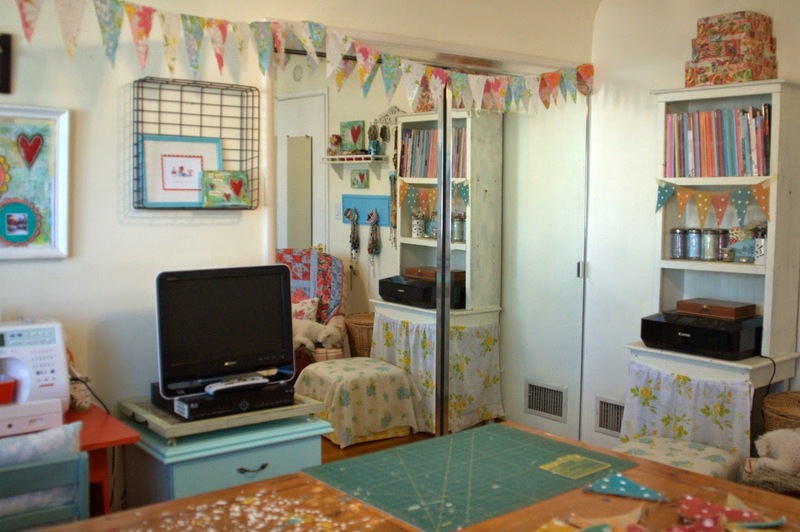 I love my sewing space, and get so much use out of it. 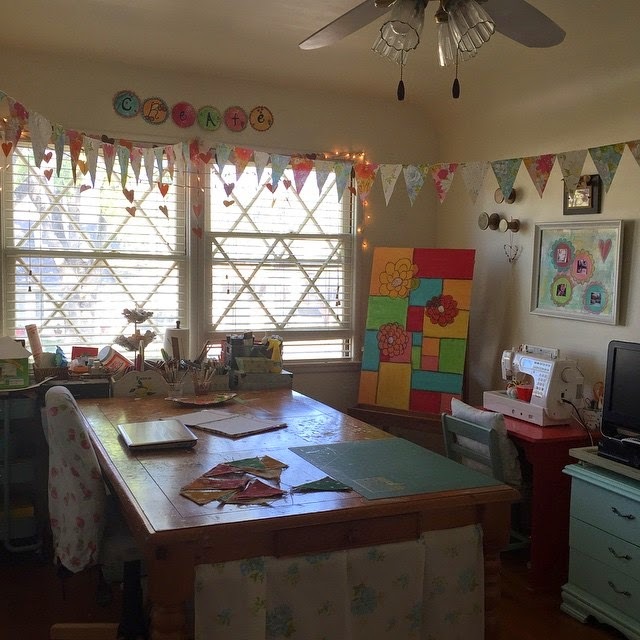 I know how much you love to create too, and this room will be your sanctuary!! 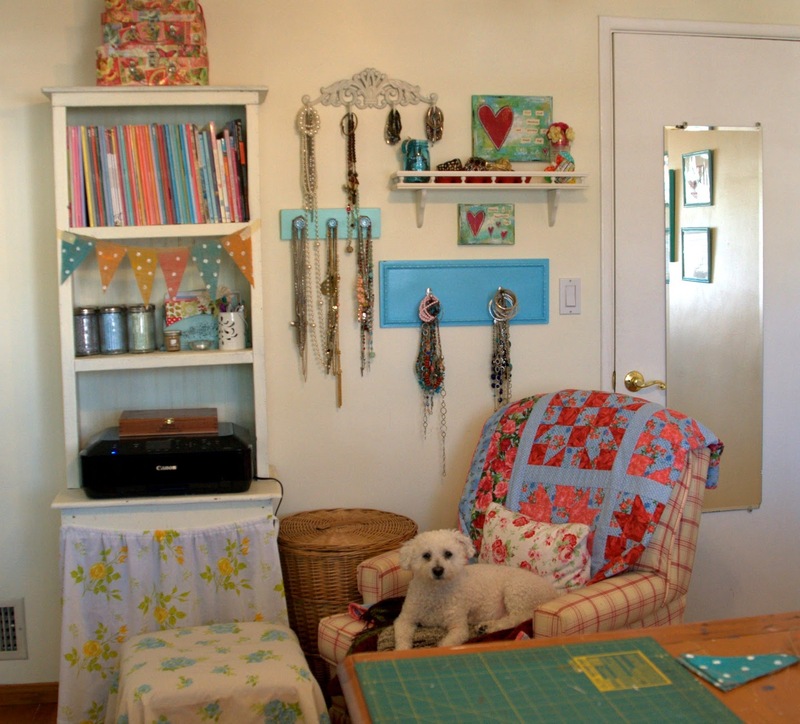 Patty, your create space is awesome and totally cute!!!! What a happy, happy place to lose yourself in! Your little stitched hearts in your other post are adorable and so unique. 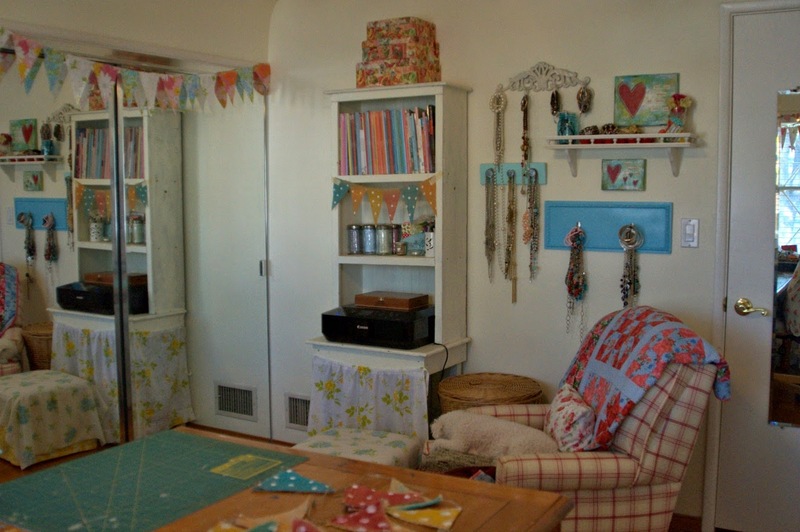 PS: I now have a sewing room and love it! 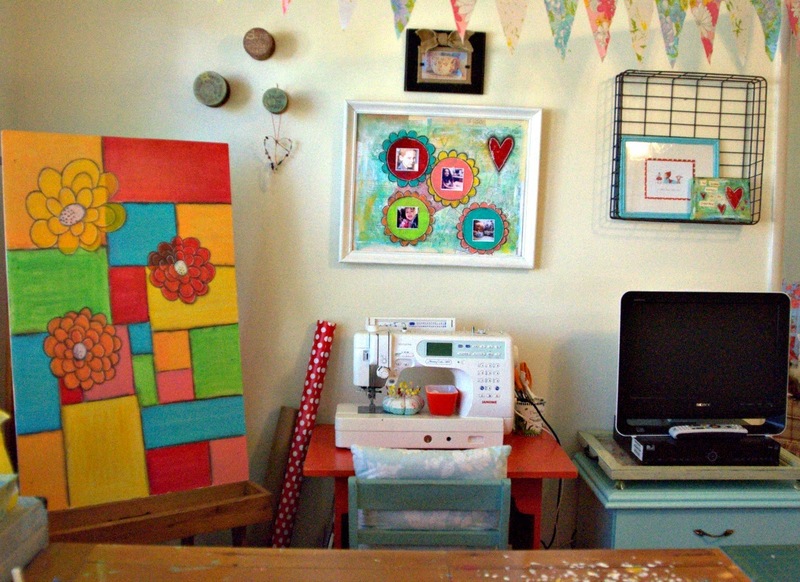 What a cute, colorful, inspiring room!! Now if you could just inspire me to get busy with my cluttered room. You are very creative and I love, love your style!! It is so happy and bright! A great place to work. Patty what a great space to work. Love all the personal bits. It looks so cosy. Here's to getting messy. Have fun. Wonderful space. Especially with all the natural light!